Presidential inaugural addresses serve an important function. Although they may contain references to specific programs or initiatives, they are not primarily policy statements. They are first and foremost civic rituals that reinforce our collective sense of what it means to be an American. The recently elected president plays a crucial role in this by calling attention to those specific principles that are supposed to define us as a people. We all are implicated in his rhetoric. But I am pretty sure that I could also affirm them if I were Muslim or Jewish. As I noted in the last post, none of these references to God is unambiguously Christian. As a historian, this does not surprise me, for as I shared earlier, no American president has ever made in an inaugural address an unambiguous, unequivocal reference to the triune God of traditional, orthodox Christian confession. The language in these addresses makes ambiguous references to God an art form. They purvey what might be called “civil religion,” a nondescript faith defined by vague references to God shorn of specific truth claims that might offend or divide. This pattern is so deeply ingrained and unvarying in inaugural addresses that we can rightly call it an American tradition. My point in stressing this is neither to condemn nor to defend civic pluralism. I simply want to put the president’s speech in historical context. If our goal is to think with Christian discernment about the American past, surely this is an important part of our national story. Having said this, I think there are more penetrating questions that we might ask of the president’s speech than how many times he alluded to God. Our religious beliefs are revealed as much in our anthropology as in our theology. Our religious worldview doesn’t consist solely of our understanding of God, in other words. It is also defined by our understanding of human nature and the human condition. As we strive to think Christianly, then, we need to be asking of the president’s rhetoric—and of political rhetoric more generally—not only what does it say about God, but also what does it say about us? Let me be clear: I am not trying to make a case for inequality per se. I do want us to realize that the language of “rights” that is so pervasive today is rooted more in secular thinking than in Scripture. The Bible speaks primarily in terms of sacrifice, not self-assertion; it defines obligations far more than rights. We must also be leery of the president’s suggestion of a future day in which the poor and powerless among us have hope not just because of their preciousness in the eyes of God but because, as a nation, we have also come to accept the equality of all people. That day may come, but as Christians we should know better than to expect it without the gracious intervention of God. God has created us from one blood, but as theologian John Howard Yoder pointed out, ever since the Fall mankind has naturally found innumerable bases for dividing and subdividing into “in” groups and “out” groups. True social harmony will never come from our giving intellectual assent to an abstract principle about the implications of our common creation. In Yoder’s words, “To make anyone believe in the equal dignity of all humans God must intervene. It took the cross to break down the wall.” And only in Christ Jesus is there “neither Jew nor Greek . . . neither slave nor free . . . neither male nor female” (Galatians 3:28). In my latest post I noted that one of the most important functions that inaugural addresses serve is to reinforce our sense of identity as a nation. Presidential inaugurations are important public rituals, and presidents have regularly used their addresses as opportunities not only to make a case for their agenda but also to remind Americans of their defining principles. (It is coincidental, I am sure, that these are invariably presented as mutually reinforcing.) In sum, inaugural addresses are symbolically important public efforts to define what the United States stands for, and this means that we all have something at stake in the undertaking. The president’s rhetoric matters. One of the most obvious questions that Christians will likely ask about President Obama’s inaugural address today concerns his use of religious rhetoric. In defining our nation’s “founding principles” and the “journey” we must still complete in order to fulfill them, did the president pay proper tribute to the place of religious faith—to Christian faith, specifically? This is a huge, and hugely complex, question, but here are just a couple of preliminary thoughts. But what do such allusions to “God” really mean? What purpose do they serve if the implication is that they carry no truth claims that would divide Christians, Muslims, Jews, and Hindus? I think this is an important question, and I know that I am not equipped to answer it dogmatically. As a historian, however, I would simply add this historical context: No American president, from George Washington onward, has ever made an unambiguous, unequivocal reference to the triune God of traditional, orthodox Christian confession (e.g., as summarized in the Apostles’ Creed or Nicene Creed). What do all of these references to God have in common? None of them is uniquely Christian; none of them is explicitly Trinitarian. There have been fifty-eight inaugural addresses since George Washington was elected as the first President of the United States in 1789. In addition to a host of euphemisms such as those mentioned above, the word “God” appears fifty-four times in those addresses. The words “Jesus” and “Christ” have never appeared. In sum, the rhetoric of American inaugural addresses has always been the language of what sociologist Robert Bellah long ago termed “civil religion”—a set of vague, least-common-denominator principles calculated to unify Americans with generalities rather than divide them over specifics. President Obama will privately take the oath of office for his second term as president at noon tomorrow in accordance with the provisions of the Twentieth Amendment to the Constitution. (That amendment, adopted in 1933, specifies that the term of the president and vice-president ends at noon on the 20th of January following a presidential election year.) Then on Monday, in a much more lavish and public ceremony (costing $50 million or more), President Obama will repeat his oath on the steps of the U. S. Capitol and then deliver to the country the second inaugural address of his presidency and the fifty-fifth inaugural address in U.S. history. Countless reporters and pundits, along with many in the public more generally, will scrutinize the president’s speech for hints of his second-term agenda. They will also parse his rhetoric for evidence of his values and vision. The latter may be the more appropriate. Inaugural addresses are not policy statements but civic rituals, and although presidents frequently allude to challenges that face the nation, when it comes to solutions they almost always speak in generalities. Specifics divide us; platitudes have the potential, at least, to unite us. And so there are, predictably, tributes to America’s past, praise for America’s people, and assurances of America’s bright future. Inaugural addresses serve several functions, but surely one of their most important is to reinforce our sense of identity as a nation. In his classic Democracy in America, Alexis de Tocqueville trenchantly observed that “the American people live in the perpetual utterance of self-applause.” This means that, when it comes to presidential inaugural addresses, we expect the speaker to reassure us that who we are (or who we are becoming) is who we want to be and ought to be. This is why, for the historian, one of the values of presidential inaugurals is that they can serve as a kind of window into Americans’ sense of their collective selves. One of the questions that it makes sense to ask of inaugural addresses, then, is what role presidents have accorded to religion in defining America’s identity. In his first inaugural address four years ago, President Obama alluded implicitly to I Corinthians 13:11 and used the word “God” four times in a relatively short address. More eye-catching, however, and far more controversial was his declaration that “we are a nation of Christians and Muslims, Jews and Hindus, and non-believers.” It will be interesting to see what rhetoric the president employs on Monday. In the meantime, in my next post I will share a few generalizations about religious references in presidential inaugurals throughout the nation’s past. Back soon. In my last post I used Ross Douthat’s Bad Religion as a springboard to talk a bit about one of the most misunderstood statements in the American past, Massachusetts Bay Governor John Winthrop’s famous declaration, “We shall be as a city upon a hill. The eyes of all people are upon us.” I noted that historians have often taken the statement out of context and discerned in Winthrop’s words an early expression of “manifest destiny,” the belief that the United States has a special, divinely ordained role to play in world affairs. Nothing could be further from the truth. 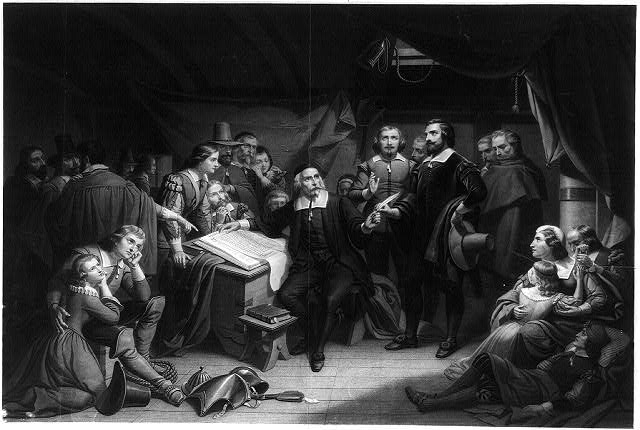 Rather than trumpeting the special mission for which God had chosen his Puritan colony, Winthrop was instead reminding his listeners that the enemies they were leaving behind in England would be closely watching their every move and hoping that they would stumble. If they did so, there would be no concealing the fact: like a “city upon a hill,” their venture would be visible for all to see. The concept of manifest destiny is still salient today, and still worth our thinking about, both Christianly and historically. Just this past autumn, the popular clothing retailer The Gap created a mini firestorm when it added to its “GC Collection” a black and white t-shirt with “Manifest Destiny” blazoned across the chest. (You can read about the episode here.) A chorus of righteous indignation immediately assailed the corporation for its egregious insensitivity. Incredulous critics circulated a Facebook petition condemning the retailer for promoting “a belief that has resulted in the mass genocide of indigenous people” and suggesting that, if the t-shirt continued to be sold, it would serve “to normalize oppression.” Predictably, The Gap quickly backed down, responding to the threat of a boycott by announcing that, “based on customer feedback,” it was withdrawing the shirt from its stores. As a historian, what struck me most was that this was one of those rare, fleeting moments when history seems to matter in contemporary popular culture. At the heart of almost every scathing condemnation of the hapless Gap was a lecture about the corporation’s unfathomable historical ignorance. And yet with history seemingly so central to the controversy, the episode evoked a boatload of dogmatic historical pronouncements but almost no serious thought about the past. More specifically, they seethed with moral judgment at the expense of moral reflection. Moral judgment, as I am defining these terms, is directed outward, as we strive to understand the world around us. Moral reflection is directed inward, as we attempt to understand ourselves. As applied to history, we engage in moral judgment when we use our critical faculties primarily to determine the guilt or rectitude of the people, events, or belief systems we encounter in our study. In contrast, we approach history as a medium for moral reflection when we determine to make ourselves vulnerable to the past, when we figuratively resurrect the dead and allow their words and actions to speak to us and ask hard, probing questions. The Gap t-shirt tempest elicited an outpouring of cheap moral judgment—moralizing that renders a verdict but requires nothing of the knowing heart. In my next post I will share some thoughts about what it might look like to grapple with a historical phenomenon like manifest destiny with the goal of genuine moral reflection. In my last post I briefly discussed Ross Douthat’s new book Bad Religion and his penetrating critique of what he provocatively labels “the heresy of American nationalism.” Douthat’s argument dovetails nicely with many of my own concerns. As a Christian historian, I have long been alert to the temptation to idolatry that awaits us whenever we study history. We face this temptation as we study the past for the same reason that we struggle with it as we live in the present: our minds are idol factories, as John Calvin so memorably put it. And as C. S. Lewis understood, even the most devout Christian can fall prey to what Lewis labeled “Christianity And,” a mindset in which we gradually blend our allegiance to Christ with any number of other loyalties. For many American Christians, “Christianity And” takes shape as we unconsciously equate the role of the United States in the world with the mission of the Christian Church to the nations. The most common name for the resulting mindset is “manifest destiny”: the belief that the United States—not the Church per se—is God’s chosen instrument for spreading Christianity around the globe. But what did Winthrop mean by this memorable phrase? The most common reading is that Winthrop was telling the colonists that God had given them a special mission. The colony they were establishing (and by extension, the future United States) was divinely destined to serve as an example to the world. God’s plan was for the new nation to model the values (religious, political, and economic) that He desired the rest of the world to emulate. Admirers of this reading have been deeply convicted by the sense of America’s high calling that it embodies. Critics have scorned the arrogance that it supposedly reflected and promoted. Both evaluations miss the mark, because both are based on a misreading of the original statement. In context, Winthrop was not remotely claiming that God had decreed a special mission for the political community that the Puritans were about to establish. For nearly a century, a minority of the members of the Church of England had believed that the English Reformation had not gone nearly far enough. Although they were openly critical of the established church, these “Puritans” had not withdrawn into secret “Separatist” congregations. Instead, they had hoped to cooperate with the state in purifying Anglicanism of surviving vestiges of Catholic hierarchy, doctrine, and ritual that they believed were unsupported by Scripture. Under Queen Elizabeth such an outcome had seemed possible, but the hopes for continuing reformation grew dim under her successor, James I, and vanished entirely when James was succeeded by the openly Catholic Charles I in 1625. The eventual result was what historians call the “Great Migration,” a massive relocation to New England of perhaps as many as 20,000 Puritans during the 1630s. In the technological context of the early 17th century, this was an undertaking of monumental proportions. In his sermon, Winthrop reminds his listeners of the seriousness of the undertaking upon which they had embarked. They were leaving England in search of a new home in which they could more effectively serve the Lord, increase His church, and distance themselves from the corruption of the English church that now seemed to them as beyond reformation. If their venture was to succeed, Winthrop stresses, the migrants must purpose to “love one another with a pure heart,” “bear one another’s burdens,” and be willing to sacrifice their “superfluities” (material surpluses) “for the supply of others’ necessities.” If they failed in these particulars, the governor warned, they would almost certainly fail in their overall mission. This brings us, finally, to Winthrop’s famous phrase. Far from claiming that the Lord had chosen the Puritan migrants to serve as a shining example to the world, Winthrop was instead reminding them that it would be impossible to hide the outcome if they failed. Their massive departure had unavoidably attracted the attention of the countrymen they left behind, and they would be watching, many of them hoping that the Puritans would stumble. If Winthrop had been writing today, he could have conveyed his point by telling his audience that everything they did would be under a microscope. The point was not that they had been divinely selected to serve as an exemplary beacon, but rather that they could not possibly escape the meticulous scrutiny of their enemies. So it is that in the very next sentence after noting that “the eyes of all people are upon us,” Winthrop warned that “if we deal falsely with our God in this work we have undertaken . . . we shall be made a story and a by-word through the world.” In so many words, he was telling the migrating Puritans that they would become a laughingstock, objects of scorn and derision. What was worse, their failure would “open the mouths of enemies to speak evils of the ways of God.” Rather than puffing up the Puritans with claims of a divine mission, Winthrop intended his allusion to “a city upon a hill” to send a chill down their spines. “Manifest destiny” this was not. One of my favorite Christmas presents this year was the book Bad Religion: How We Became a Nation of Heretics, by New York Times columnist Ross Douthat. Since I almost never read the Times, I was not familiar with Douthat, but I was intrigued by the title and I was encouraged to read it when I spotted endorsements on the back cover by pastor Tim Keller and fellow Wheaton faculty member Alan Jacobs, among others. The thrust of Douthat’s argument is neatly captured in the book’s title: “America’s problem isn’t too much religion,” he contends, “or too little of it. It’s bad religion: the slow-motion collapse of traditional Christianity and the rise of a variety of destructive pseudo-Christianities in its place.” I don’t agree with all of the particulars of the argument, but Bad Religion is engagingly written and thought provoking, and I think there is much in it that American evangelicals need to hear. There are far worse ways to spend your time at Starbucks (or Caribou Coffee, which happens to be my personal “third place”). If you are interested in the relationship between religious faith and American history—as you probably are if you are reading this blog—I think you would find the book especially intriguing. Bad Religion is essentially a lengthy interpretive essay about the changing contours of American religious belief since the middle of the last century. Equally interesting to me, the book concludes with a chapter that touches on how Americans have remembered their past. This latter may sound esoteric, but it is extremely relevant to any believer interested in what it means to think Christianly about history. As I always stress when speaking to Christian audiences, “Christian history” is not just ransacking the past for evidence of Christian influence or for stories about Christian heroes. More broadly, and far more importantly, any “Christian history” worthy of the name should involve the conscious application of Christian precepts to our study of the past in all its breadth and complexity. For my part, one of the most important Christian principles to keep in mind when studying the past involves what the Bible has to say about us. My understanding of Christian theology tells me that ever since the Fall, human beings come into the world with two overriding desires: the desire for self-rule and the desire for self-gratification. These twin drives are related, of course. We want to rule ourselves in part because we are determined to please ourselves. What this means when it comes to the study of history is that we will always struggle with the temptation to interpret the past in self-justifying ways. Orthodox Christianity has also long pointed to our propensity to idolatry. In his Institutes of the Christian Religion, John Calvin observed centuries ago that the human mind is “a perpetual forge of idols.” In context, Calvin was addressing the literal worship of physical objects as a substitute for God, but other writers have broadened Calvin’s insight to apply more generally, pointing to our tendency to waver in our allegiance to God, to elevate things or people or desires to the position of primacy in our hearts that belongs to God alone. This need not be conscious. It is so easy to intertwine our Christian faith with some other seemingly compatible allegiance—to a particular social cause, economic system, approach to education, or political party, for example—until the former becomes merely a means to promote the latter. (In his Screwtape Letters, C. S. Lewis called this heresy “Christianity And . . .”) When it comes to thinking about the past, however, I think that this temptation to idolatry is most often manifested when we grapple with the relationship between our identity as Christians and our heritage as Americans. Here is where Douthat’s concluding chapter—titled “The City on the Hill”—is most relevant. Douthat’s focus is on “the heresy that increasingly disfigures our politics, on the left and right alike: the heresy of American nationalism.” Douthat’s choice of words is intentionally provocative, but he is not attacking a Christian patriotism that expresses gratitude for God’s blessings to our nation, an appreciation for figures from our past, or a conditional loyalty to our government. He has in mind instead a constellation of values that, whether explicitly or implicitly, equates our nation with the new Israel, conceives of Americans as God’s “chosen people, or assigns to the United States a missionary role to the world that the Lord has reserved for his Church.” You may or may not agree with his theological assessment, but as a historian I would assert that this form of nationalism has regularly distorted our understanding of the past. One simple example, which Douthat highlights, is the way that we frequently misremember Puritan John Winthrop’s famous allusion to a “city on a hill.” The Massachusetts Bay governor’s allusion is simultaneously one of the most quoted and least understood statements in all of American history. We’ll turn to it next. Here’s wishing you and yours a blessed 2013!